The garden is planted and growing beautifully. Last week we dug up the first crop of potatoes. Yum, my favorite. I can’t wait to start harvesting some of my other favorite vegetables too. 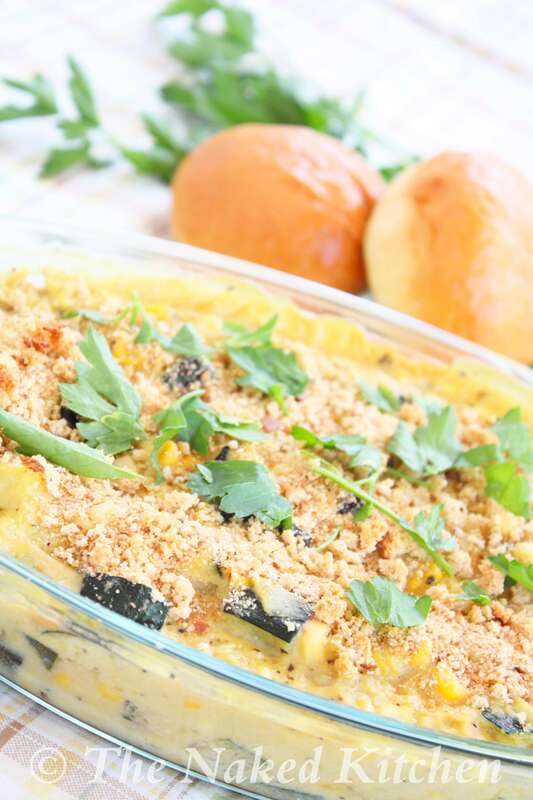 This recipe features a couple of garden classics, zucchini and corn. The corn is used 2 ways. First it’s sautéd along with the zucchini and then the rest is blended with milk to make a rich and creamy sauce. This dish is a step up from plain old corn on the cob. It’s ideal for a potluck too. Dig in and enjoy. In a large skillet heat the oil to medium high. Add the onions, zucchini and 1/2 tsp salt. Sauté until the vegetables are tender, about 5-7 minutes. Add 2 cups of the corn, oregano and pepper. Sauté 1-2 minutes. Place the remaining 1 cup of corn, milk, nutritional yeast, remaining 1/2 tsp salt and hot pepper sauce in a blender and process on high until smooth. Pour into the pan with the vegetables. Stir to combine and cook until heated through, 2-3 minutes. Taste and add additional salt or hot pepper sauce if needed. Transfer to a casserole dish and top with the bread crumbs. Bake 20-25 minutes until hot and bubbly. Top with chopped cilantro or parsley and serve. Store leftovers in an airtight container in the refrigerator for 2-3 days.